If you're already registered or are a Con Edison employee, please log in. If not, please register. PLEASE NOTE: Con Edison employees do not need to complete the full registration. You can login with your employee email address. 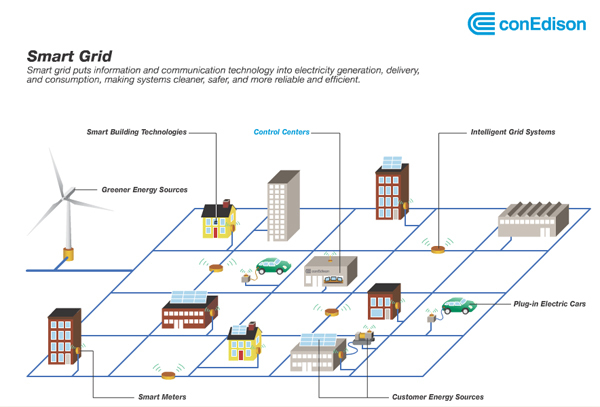 Smart grid combines various technologies that modernize the electric grid, including self-healing capabilities. It also allows for a two-way flow of energy and information between customers and utilities that would ultimately decrease energy consumption and cost to the ratepayers. Click above to view the interactive Smart Grid Movie. 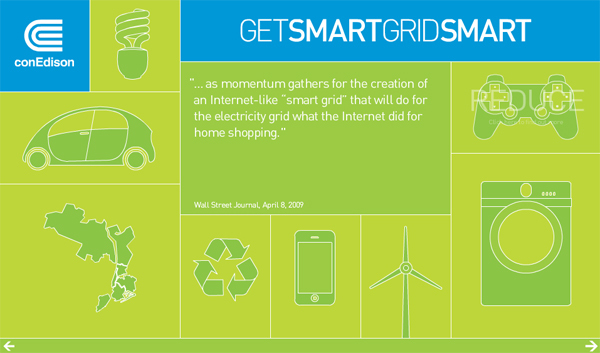 Click above to view the interactive Smart Grid Illustration. A smart grid puts information and communication technology into electricity generation, delivery, and consumption, making systems cleaner, safer, and more reliable and efficient. How will customers benefit from smart grid? Customers will benefit from increased reliability, added capacity through increased system efficiency, reduced outage response time, and reduced operating and maintenance costs. What is involved in the pilot program? The smart grid demonstration allows the company to use technological advances in the delivery and management of energy for and with its customers. Specifically, the pilot program tests the integration of intelligent underground equipment, advanced metering infrastructure, smart building technologies, conventional and renewable distributed energy resources, and a plug-in electric vehicle charging infrastructure. Who will benefit from this pilot project? This is a learning experience and all customers will ultimately benefit from the knowledge captured from the pilot both by the information learned and the economies of this pilot demonstration. In the immediate future, approximately 1,500 customers will receive smart meters and nearly 300 of them will communicate energy usage information via other smart building technology to web portals and in-home displays to allow customers to monitor their energy usage. These web portals and in-home displays gather energy usage information from a corresponding smart meter. As the test progresses, customers will be able to correlate their energy usage to pricing signals, providing Con Edison with valuable information about customer energy usage pattern. This will help the company design rates that are attractive to customers and encourage conservation and off-peak usage. Other features of the smart grid are designed to integrate information across the power system, so that we can improve our use of existing infrastructure, respond more quickly to power system events and defer or avoid future upgrades through more effective utilization of power system equipment. What are some of the challenges of a smart grid in New York City? Smart grid technologies must be able to accommodate the unique qualities of our electric system and population. One of the challenges is the terrain of the city: the buildings in New York City create canyons which make a conventional wireless communication approach difficult without significant investment. A vast majority of the electric infrastructure is underground and requiring equipment to be quite rugged and presenting challenges for wireless communication. The overall density of the company’s electric infrastructure compared to other population centers and electric utilities is also a challenge. Furthermore, the typical New York residence is quite different from other less urban populations in the country, in terms of size and energy consumption. Can New York can be a model for smart grid? New York can certainly be a model for smart grid, especially for other dense urban areas. New Yorkers enjoy the highest electric reliability in the US; our electric system and the various innovations we implement to improve electric service can be a model for other utilities. The unique challenges in New York and the solutions we will test and refine in the smart grid demonstration can contribute to success in implementing smart grid in other areas with similar challenges. Who is paying for the current smart grid initiatives? The Smart Grid initiatives are funded in part from two significant grants totaling $181 million from the Department of Energy through the American Recovery and Reinvestment Act. Does the technology exist today for a full smart grid? How do renewables play into a smart grid? Plug-in electric vehicles? Renewable energy resources can provide additional generation, that can offset the energy required to supply customers and can provide system support during contingencies. It should be noted, however, that sometimes system changes are needed to accommodate distributed generation into the electric system. Electric vehicles present unique challenges and opportunities for our system as well. To reduce the impact to the system, controls and pricing schemes can be set-up to encourage customers to charge their cars at night during off-peak hours. In the future Plug-in electric vehicles may also potentially serve as a distributed resource and support the electric grid; dispatchable control and smart grid technology is required to accomplish this. What are you doing with renewables? Con Edison is part of a newly formed collaborative between the private sector and a host of New York State and New York City agencies working on what could be the largest offshore wind farm proposal in the country. The offshore wind project would be situated approximately 13 miles off the south shore of the Rockaway Peninsula in the Atlantic Ocean. The wind project would likely be designed for 350 megawatts (MW) of generation, with the ability to expand it to 700 MW, giving it the potential to be the largest offshore wind project in the country. We even have a joint Web site: www.linycoffshorewind.com. Make a positive influence on legislative issues.